The birth of a baby should be a time of joy, but for too many parents, what should be a joyous occasion is filled with grief. From congenital birth defects to avoiding injuries, newborn babies can suffer from a wide range of life-threatening problems, turning what should be the happiest day of their parents’ lives into a time of mourning. While there is not much parents can do about inherited birth defects, injuries that occur during the birthing process are another matter entirely. While parents can have their fetuses screened for common conditions and follow common sense precautions, the burden of preventing injuries that occur at birth lies entirely with the doctor and the rest of the medical team. If you feel that your own family has been touched by a preventable injury – one that took place during the birth of your child, it is important to educate yourself and know your rights. Some in the medical community will try to pass off birthing injuries as congenital birth defects, or as inheritable conditions that had nothing to do with the doctor or the rest of the staff. Only by educating yourself and learning the facts can you respond – and get the financial settlement you will need to take care of your injured son or daughter. There are a number of medical conditions that can be caused by the physicians assisting in the birth. While most doctors are caring and conscientious, a small handful are not as careful as they should be. It is the victims of these individuals that suffer the most, and it is up to affected parents to seek the justice they, and their defenseless babies, deserve. Here are some of the injuries that can occur as part of the birthing process. Brachial Plexus Palsy – This condition is caused when the bundle of nerves near the baby’s shoulder are compressed. This typically takes place when the baby’s shoulder becomes lodged in the mother’s birth canal. Some of the earliest signs of brachial plexus palsy include arm weakness on one side of the body, paralysis of the diaphragm and paralysis of the eye. This condition is most common in births aided by vacuum or forceps, although it can occur during normal births as well. Erb’s Palsy – Erb’s Palsy is typified by absence of the so-called Moro reflex, the normal movement of the arm or hand. Other symptoms include a weak or absent grip on one side, and in some cases brain damage is also present. In most cases, Erb’s Palsy affects the upper arm. Klumpke Paralysis – This form of paralysis is signaled by weakness in the baby’s hand, and the affected newborns will not possess a normal grasp reflex. Parents may also notice that the baby’s eyelid droops on one side. While Klumpke Paralysis sometimes resolves on its own, in other cases the damage is more permanent. If the condition does not get better on its own, the affected newborn could suffer from brain damage and learning difficulties throughout their life. There are a number of birth injuries that can cause brain damage in newborns, starting with asphyxia neonatorum. This is caused by decreased oxygen levels in the baby’s bloodstream, and it happens when the newborn fails to breathe at birth. This condition can be associated with a crimped umbilical cord, and the resulting loss of oxygen can result in brain damage and even death. Kernicterus is another form of brain damage that can take place at birth. This condition often presents as jaundice in the newborn, and the movement of high bilirubin levels into the brain. Affected newborns can suffer from cerebral palsy or even death if not treated promptly. Perinatal stroke is another birth injury that can result in brain damage. This happens when the baby suffers a stroke either during or immediately after the birthing process, and it results in a lack of normal movement and a disruption in normal muscle tone. 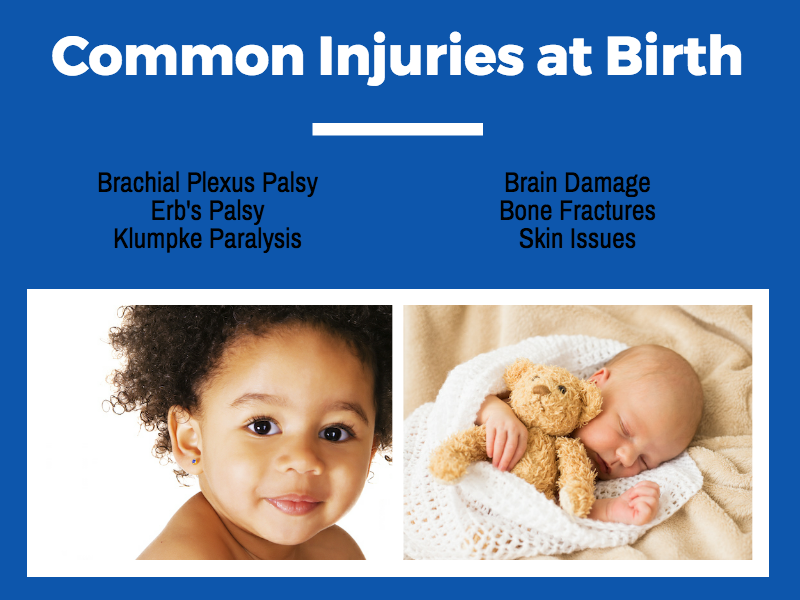 There are a number of other injuries that can occur during the birth of a baby. Whether caused by improper medical care, a lack of training or a simple accident, these conditions can be devastating, or even deadly, to the newborn. During breech deliveries, the baby may suffer from fractured bones, creating a painful condition that can linger for months or even years. Broken collarbones and fractures to the arms and legs are the most common examples of this birth injury. Babies can also suffer skin damage and subsequent problems, especially when forceps are used to aid the delivery. These skin problems range from minor bruising that goes away on its own to major hematomas and even paralysis of the muscles surrounding the throat, mouth and salivary glands. Welcoming a new baby into the world should be a joyous occasion, and for the vast majority of parents, it is. Most newborns suffer no ill effects as a result of the birthing process, but a small number encounter devastating injuries that can impact their quality of life, and the quality of life of their parents, for the rest of their lives. If you feel your child has been the victim of a birth injury, it is important to contact an experienced attorney as soon as possible. The attorney you hire can gather the evidence, build your case and get you the financial consideration you need to care for your injured child.